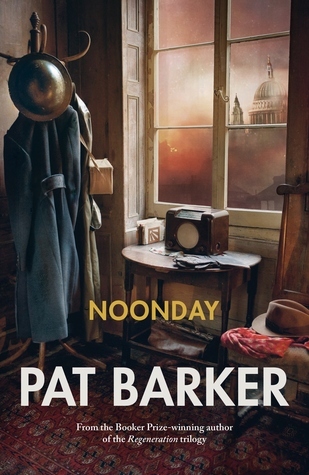 Well, I never thought I’d be saying this about a novel by Pat Barker, but I found Noonday banal. It’s basically a not particularly interesting version of the eternal triangle with the London Blitz as a backdrop, and the ending is trite. Noonday completes the story of Paul Tarrant, Elinor Brooke and Kit Neville whose story began in Life Class and continued in Toby’s Room, novels which tread the well-worn paths of Ypres and the Somme and the concomitant loss of hope, faith and sometimes a moral compass. These characters are all artists who first met at the Slade School in 1914, but in this novel all three are risking their lives as the Blitz rages – Elinor and Kit as ambulance drivers and Paul as an air-raid warden rescuing people from bombed houses. As you might expect, none of them have time to do much art but Kit (who also has a desk job in the Ministry of Information) spends his time bitching about how he’s been overlooked by (the real-life) Kenneth Clark for commission as a war artist. Kit is sour and embittered because his face still bears the signs of reconstructive surgery after WW1 and because his marriage has failed, but it wasn’t the predictability of the novel’s resolution that irritated me so much as the bizarre characterisation of a medium called Bertha Mason. Because the novel vacillates between all the characters’ points-of-view, we get hers too, and so we are expected to believe that although she’s been imprisoned for fraud because of her activities during séances, she really does commune with the dead – and that a level-headed character like Paul finds this convincing. In Michelle Roberts’ review at The Independent, I learned that Graham Greene invoked the paranormal in his WW2 fiction (referring to The End of the Affair’s experience of God) and I know that mass bereavement fosters an impulse to try to hear from the lost one, but Bertha Mason’s spiritualism is IMO utterly unconvincing and she clutters up this novel with nonsense that doesn’t qualify as an absurdist response to an insane world. Critic Gaby Wood at The Telegraph had doubts about this characterisation too. And I agree with Gaby Woods thoughts about Barker’s pedestrian sentences. With a few striking exceptions, the prose is flat and dull. Elinor’s diary is particularly clunky and some of the imagery is merely sordid rather than striking. When I think back to Barker’s compelling Regeneration Trilogy I find this novel really very disappointing indeed. Critic Lara Feigal at The Guardian seems to have similar reservations to mine, and so does Robert McCrum in the same newspaper but be careful, his review is littered with spoilers which give away almost the entire plot. Bertha Mason? I thought I recognised that name…. She was the mad wife in the attic in Charlotte Bronte’s ‘Jane Eyre’. I wonder why Barker chose that name for her medium? If you read the reviews that I linked to, it seems she has drawn quite a bit on the work of others, (which confirms my view that her originality is waning). But re Bertha Mason (who does actually live in an attic in the novel, but so does Elinor), I’m guessing, but maybe since Wide Sargasso Sea there’s been a revision of Jane Eyre’s C19th view of ‘madness’ so that now her Bertha can be interpreted as a sane, maybe visionary person not fitting into society. Maybe Barker is trying to suggest with the name that her Bertha is the same? I see from the discussion that you have reservations about reading the Regeneration Trilogy. It’s a long time since I read it, and I tended to rate books more highly then than I do now, but I did think it was excellent and would probably be very useful for your research. It is hard to want to read them though after Life Class. A conundrum!